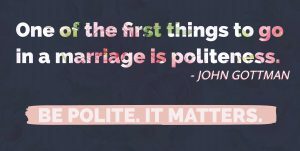 According to Dr. John Gottman, being polite in relationships is one of the first things to go. Dating brings out the best in us. We put our best, shinnyest foot forward, putting in extra effort to make a good impression. We are eager to please. Not surprisingly, we tend to receive the same in return. We experience our partner to be kind, generous in spirit, and polite. Being polite in relationships comes naturally when we first start out, yet for most, politeness is the first thing to go. Eventually we commit. We settle in. We get comfortable. Well, maybe it’s not so much “comfortable,” maybe it’s that we become inattentive, or distracted. It’s easy to turn our attention elsewhere (work, family, hobbies, friends, etc.) when we feel safe in our relationship. We begin to notice more about what we don’t like, than what we do like. We begin to express our frustrations and concerns, rather than focusing on all of the things we love and enjoy. If this negative focus persists without intervention by one or both partners, eventually, we run the risk of the four most toxic relationship behaviors to seep into our relationship. Rather than being polite in our relationships, we begin to be defensive, critical, contemptuous and all of this can lead to stonewalling by one or both partners. Is being polite in relationships important to you? Have you said “thank you” to your partner lately? Just because she loves to mow the lawn, that doesn’t mean you can’t be grateful when she does. Always say thank you. Every time your partner exercises an act of love, be it big or small, it is important to acknowledge and express gratitude for that love. Every behavior, action or contribution either partner makes to the relationship deserves recognition and appreciation. Have you said “thank you” to your partner lately? Being polite in relationships matters. If you want to get a good snapshot of how your relationship is going, consider taking the Gottman Relationship Check-Up Assessment, Both of you complete a thorough relationship inventory and received detailed feedback about your strengths and challenges.